The other day I went over the speed limit during a journey I left late for, I could feel the rush and raciness in my body yet I pushed on through, a good lesson for me to give myself space and plenty of time. The more settled I feel in myself the more flow I find on the roads when I drive: The more I am in touch with the innate qualities within me the more I am in harmony with a natural rhythm of all life. To me anytime we re-connect with ourselves and slow the rushed and racy movement of life down is a awesome thing. I really appreciate since re-connecting more with me and feeling much more solid and present in my body how the quality of my driving has changed. Who said fast was best? ….. from my experience and observation when we go fast in life with anything it is normally because we are stressed, not considering others or avoiding feeling something. This evening I drove in medium traffic and was at ease with driving less than the speed limit rather than go over to overtake and not get caught in the rush home. I wasn’t rushing home because I was at home with myself. Was feeling sad about some things but that was ok – I didn’t have to rush home to numb out on TV or food, or just shut out the world – if that were ever possible. I love this, instead of rushing to go ‘home’ knowing the true ‘home’ is actually within us all the time. I love this too, Vicky and Karin. How beautifully we can be in the world when we are in full awareness that “…true ‘home’ is actually within us all the time.” It conveys the simple truth of how being truly at ‘home’ is being at one with the All. Being late can be a hard habit to break, I know I still find myself being late even when I know the consequences it can bring. I find that when I am in a hurry, not allowing more space before I depart for work I find I get all the red lights, get caught up in traffic, feel the need to rush & put my foot on the pedal so as not to arrive late. I then feel annoyed because I usually arrive at work 5- 10 mins late & then for the rest of the shift I am in nervous energy & feeling racy. However, lately I have been trying to leave home earlier and the experience is so different. I hop in my car with gentleness, my driving is more flowing and calm- I stick to the speed limit. I find I don’t get all the red lights & even if I do I am reminded to take the stop moment to feel my body and come back to me. I arrive on time. I walk in with authority and grace. I am open and cheerful; I greet everyone with an open-heart and enjoy every connection I am constellated with- there is purpose. I love feeling the way you describe the two very different ways you can end up at work’s doorstep, Loretta, and the contradictory ways your shift unfolds as a result. Awesome. It is really interesting to appreciate how we change and grow, and then look back at something we used to do as normal and it feels really foreign and unnatural in the body. Really? I didn’t use to do that, did I? Having an attitude that we need to allow all our destructive and non-loving behaviours to RIP – now that is evolution. The racy energy we have to align to so we can drive at super fast speed instead of the speed limit sets us up to also be racy in our day. Having the commitment to respect and honour the communities we live in, is certainly a step forward in our evolution. Yes, we have no right to judge others when driving fast is or has been a part of our lives. It makes observation the norm when we have this understanding. I am amazed still by how even adjusting the speed of my car by a few miles or kilometres per hour makes a big difference to how my body feels when driving. It is a very real and physical experience. I’ve noticed that there’s only ever a rush on when someone somewhere in the equation hasn’t taken responsibility. So someone’s ended up in a predicament, not wanted to accept their part in it, panicked and ran for help. Help see the situation and the consequences and try to rush for a ‘favourable’ outcome, the person receiving the support gets the relief of it being sorted and goes out to repeat the same situation. All my life I’ve tried to save people from the consequences of their choices because I’ve not been able to handle this tension: the tension before the fall. What I’ve not appreciated is the grace that can follow when we do learn the lesson and the love we can bestow upon ourselves to never repeat our follies. This is so gorgeous what you have shared here, Karin. ‘….there’s only ever a rush on when someone somewhere in the equation hasn’t taken responsibility.’ I can feel the truth of this in every bone in my body. Yesterday I was heading home from work earlier than usual; it was overcast so cars had their headlights on yet it was light enough that I could see traffic clearly in my rearview mirror. Ahead of me and around me the motorway traffic was clear, flowing and spaced beautifully. What I saw in my rearview mirror was the exact opposite. A few hundred yards behind me it was like there was an invisible line drawn across the motorway keeping the traffic behind me at bay, and it looked like there were hundreds of headlights all bunched together. Feeling into the energy of the congestion behind me felt like the energy I used to race around in and I know that I would have been one of the ones stuck in that congestion years ago. The picture is a very different one for me now as I am choosing responsibility in all areas of my life and the effect of choosing responsibility is being reflected back to me in moments such as this – quite a dramatic confirmation of the consequences of choosing and taking responsibility versus not doing so. 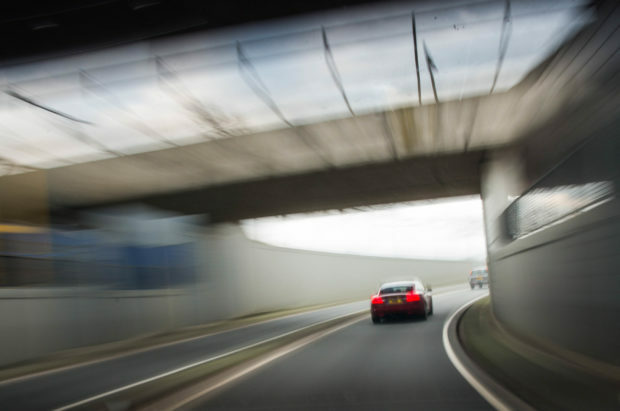 This new way of driving feels so much more relaxing and nurturing for your body, ‘Instead of attacking the motorway with speed I simply continued to move and drive in the steady flow of my new alignment: doing so allows space for everything around me to constellate’. I love the shift in feeling in your blog Brigette, from one of speeding down the highway to one of appreciating the the scenery along the way, such a great metaphor for the way we move though life. I too edge into the zone of going a little to fast at times, and find that by leaving things until the last minute puts me into a state of rushing just to be there in time. What I can also feel is how this rushing can flow on and impact my entire day too. I too can feel how this rushing can flow on and impact my next movement, Chris. The immediacy of it can be mind blowing and it feels like once the rushing has set in, it opens me up to reverting back to that old energy and before I know it I am judging the other drivers on the road or looking to overtake the car ahead of me which, in order to do so, would mean speeding just for the sake of overtaking. I have become much more adept at calling this energy out before it takes hold but it is a constant process of refinement. “Speedy Gonzales is dead.’ And your version of him certainly needs to be, as does it for all of us. To tear up the countryside for so called enjoyment, putting communities at risk – yes the time for a good burial is at hand. I have spent a lot of my life driving on cruise-control, driving just to the maximum that is the posted speed plus 5%. It was a game to see how late I could leave it and still arrive on time. With the advent of Sat-navs came the racing against time, to the same location to beat your own score. It is a game you can never win. Today I use space that doesn’t have time in it. To be on time as in in rhythm with the pulse of the universe is to be on the direct path home. Hear hear, LE. Remembering what it is like to be on, and returning to, the direct path home is the most awe-some feeling. It is simply a matter of aligning and being ‘in rhythm with the pulse of the universe’ which brings it all back to the choices we make – are our choices in harmony with the rhythm of the universe, or not? LE on reading your comment I could feel the absolute synchronicity and harmony of being ‘in rhythm with the pulse of the universe’ and I could also feel the discordant twang when we are not. Brigette your blog is a great example of how when we change one part of life and establish a more self loving and supportive quality in the way we do things, it then flows into other areas of life. There are moments when I really enjoy an open road and a bit of speed. I feel like I am giving myself permission to be strong and unafraid to move forward. There are other times when there is a raciness in the way I drive that does not feel settled on the road and these are the moments for a quiet, honest review about what is going on. I know what you mean Matilda, there are days when I feel very confident and solid when on the road and then there are the days when I feel as though I have to watch out more for others and can’t wait to get to my destination. I agree it does offer an opportunity to evolve. Yes, if its early morning and the road is empty I can enjoy driving at speed, (this is rare in the UK). However, I am aware if a raciness tries to creep in, which feels horrible, and so choose to stay with my quality and my speed is secondary. I have also noticed that my body feels much more relaxed and at ease when I am driving at the speed limit. Wow what a turn around Brigette, amazing to clock how much our movements whether in a car or on land so to speak impacts us and all those around us. Driving in harmony with the car, road, traffic and yourself feels as if you are flying and your feet are still on the ground with the road open and flowing in-front of you! Haha! I love this, Greg. I totally agree that ‘driving in harmony with the car, road, traffic and yourself feels as if you are flying and your feet are still on the ground….’ It absolutely is flying with your feet still on the ground; flying not at speed, but in a manner that is in consideration of self and all others on the road in such a way that space opens up and flight takes place because of space rather than speed. I am finding that if I maintain a feeling of spaciousness then I seem to get an incredible amount done as opposed to closing down the space by being in a rush to finish things and yet not getting as many things done and the things that I do manage to do are done rather tattily. It is interesting how we value the lives of others (like your son’s) but we are prepared to gamble with our own lives when speeding too fast. What about the unsuspecting others we may involve if we misjudge a bend? This is something I am considering when tempted to drive too fast. Slowing down whilst maintaining a focus in all aspects of life feels great… not just when driving in the car! I used to think being quick, speedy and sharp was it – today I realise that none of these expressions are worth an iota without my amazing love being present in it all. Focusing on quality of movement, connection to self and others, being light hearted and present brings a delicious silkiness to every thing and who wants to rush that? Could it be that we are all rushing around being quick, speedy and sharp because just under the surface we are feeling how empty and meaningless rushing around is without our amazing love being present in it all? Are we wanting to get through in a rush in an attempt to get through the utter meaninglessness we feel only to bump into it again as we round the next corner or get stopped at the next traffic light? Once I started to feel the delicious silkiness as you so eloquently express it, Rowena, I wanted to stay with it and I began to feel how the minute I started going back in to rushing, it took me away from this delicious silkiness – not just in the car on the road but in all aspects of life. It is crazy how we put ourselves under pressure by leaving home late and no surprise that when we are rushing/speeding that we encounter traffic jams etc. Allowing myself the space to leave in good time I am constantly amazed at how I never get held up and often arrive early – so much more pleasant way to start the day and this is reflected in everything that follows. Yes. A simple and life changing approach to life. Making space for ourselves rather than battling with time. Yes, it’s funny but now when I have a lot to do and contemplate picking up the armour ready to go into battle I keep coming back to, it really isn’t worth it. Like I don’t get more done I get stressed and have to take longer breaks. Reminds me of the hare and tortoise fable but where I get so much more completed when I’m not wasting time thinking about all I’ve got to do. We don’t just put ourselves under pressure, we also place ourselves (and others) into danger because of the speeding. Has anyone noticed how driving faster than we feel equipped to do can cause a huge anxiousness in the body? Some days there is this solid confidence and then others there is this uncertainty. Driving is a great reflection. When we drive too quickly we don’t have time to read the road conditions, everything that we pass on the way or is happening at the side of the road. This shows us that this is our approach to life too, that we are trying to speed everything up so as not to be able to read all that is happening and that is presented to us as it comes to us. Bringing our driving back to a reflection of how we are living life is taking full responsibility for our every movement. I love how you are reminding us of the beauty and power of reflection, Michael. Its sort of funny knowing that harmony is all around us we just need to re-connect to it. I used to love zooming around the place until I was involved in a road traffic accident. Then the speed at which I used to drive terrified me. I had this huge arrogance that nothing could touch me when driving in my car, but suddenly I had been shown that I was even more vulnerable. A superb lesson that enabled me to really appreciate the responsibility we have to everyone including our selves when we drive. I can relate to ‘this huge arrogance that nothing could touch me when driving my car…’, Rowena. It’s like being inside a metal box on wheels has us convinced that we are immortal. What I have found since stepping out of this energy of arrogance is that I can feel this arrogant energy in others now as they speed by feeling invincible. With every speeding driver racing past me, my appreciation for having stepped out of that energy deepens. RIP Speedy, and RIP the arrogance of thinking that the car driver owns the road. Thank God for that! Every road trip is an amazing opportunity for review. How we get into our cars, how present we are on the road, how aware we are of the way others are moving and how much we let ourselves enjoy the drive. I am coming to understand this more and more, Matilda, that even ‘routine’ movements such as getting into my car, how I close the car door and how I walk away from my car at the end of every road trip all have an impact on my being and my time on the road. The more conscious I become with every tiny little movement, the more spacious my day is and the less I see of speeding cars, tailgating and road rage. Changing the way I am on the road has resulted in a complete change in what is reflected back to me confirming how loving the changes have been. My inner metabolism has been much more speedy recently as I have found myself falling into periods of rushing at work in order to keep on top of things. That feeling of being sped up on the inside is awful. It feels like I’m being pulled inwards and tightened (which physically I am).